Impromptu (ex Mia Elise) is among the most popular members of our charter fleet. She is a six stateroom family-friendly choice for luxury charter with her timeless interior design by Patrick Knowles offering a refined yet inviting ambiance. 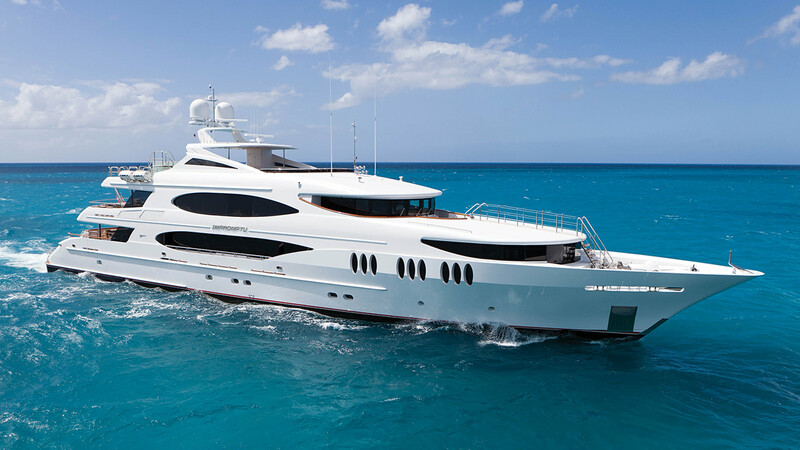 The impressive split-level master is situated on the main deck forward with his/hers bathrooms and an elevated lounge. The 5 ensuite guest staterooms are equally well-appointed: a VIP queen on the bridge deck and 3 king and 1 twin staterooms below. Impromptu tows a 39 ft / 11.88 m Nor-Tech center console / 3 x 300 hp / rigged for fishing which is available year round and a wide variety of toys including a water slide, WaveRunners, SeaBobs and small sailing dinghy. The yacht is equipped with zero-speed stabilizers to ensure comfort. The sundeck is a favorite area for entertaining, featuring a newly upgraded sound system. The large raised Jacuzzi pool and chaise lounges are located aft. Under the shade of the arch is a large bar, a casual dining area and a powder room. Forward is a large sun pad area with optional umbrellas and a customized outdoor movie screen for movie nights. The sky lounge features a 120 bottle wine cellar, bar, game table and ample seating. The sky lounge aft deck offers alfresco dining and seating on the stern.